A senator in the Philippines who touts himself as a strong advocate for education just recently demonstrated amazing ignorance regarding social media. 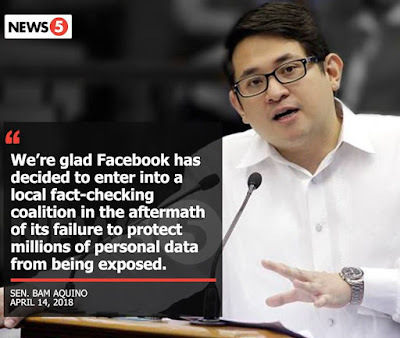 The Inquirer quoted Senator Bam Aquino, "We’re glad Facebook has decided to enter into a local fact-checking coalition in the aftermath of its failure to protect millions of personal data from being exposed." Privacy protection of Facebook users is totally a different issue from fake news. On privacy, Facebook users need to be more aware of what they actually share with their friends and the public on social media. On fake news, Facebook users need to exercise a bit more skepticism and a lot less gullibility. If a senator could not see the obvious difference between these two issues, what could one expect on issues that are more complicated like education? Perhaps, the oversight was simply due to an extreme excitement that Facebook had chosen to partner with media obviously aligned to his party. However, his past actions on education had been illustrating a general lack of prudence and an overabundance of pandering. The senator had often claimed responsibilty for free tuition in higher education in the Philippines - a move that was highly questionable especially with the fact that the country's basic education needs were not being met. As long as education continues to be shaped by leaders who lack thoughtfulness and simply cater to drawing appeal from the voting public, hope for a better Philippine basic education is dim.